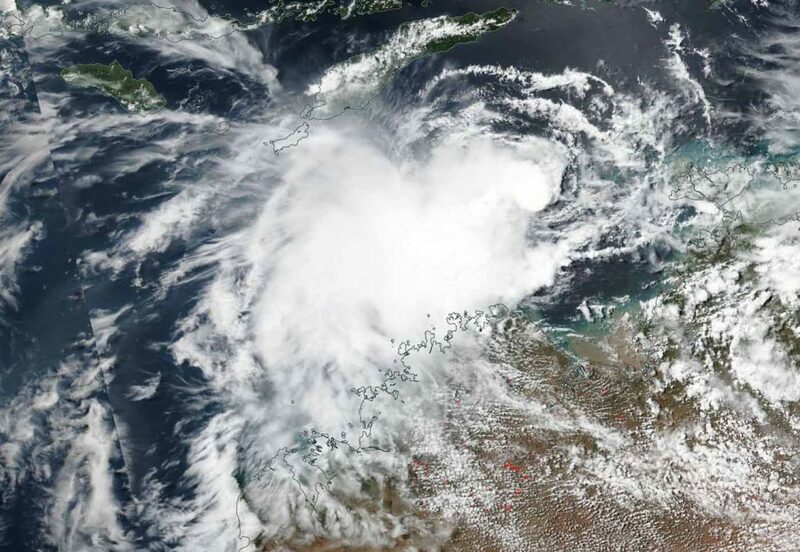 Tropical Cyclone 23S has developed north of the Kimberley coast, and generated warnings. NASA-NOAA’s Suomi NPP satellite passed overhead as the low pressure area consolidated into a tropical cyclone. NASA-NOAA’s Suomi NPP satellite passed over the Southern Indian Ocean and captured a visible image of Tropical Cyclone 23S or Wallace, on April 5, as skirted the coast of Western Australia. Credit: NASA Worldview, Earth Observing System Data and Information System (EOSDIS). 23S is expected to be renamed Tropical Storm Wallace as it falls in Australia’s area of responsibility, and follows their naming list. The Australian Bureau of Meteorology or ABM posted warnings from Kalumburu to Beagle Bay, not including Derby. JTWC stated at 5 a.m. EDT (0900 UTC) that 23S was located near 12.0 south latitude and 127.4 east longitude, about 207 nautical miles (238 miles/383 km) west of Darwin, Australia. 23S was moving to the west-southwest and had maximum sustained winds near 35 knots (40 mph/65 kph), making it tropical-storm force.